The Global Egyptian Museum | Relief of the scribes. 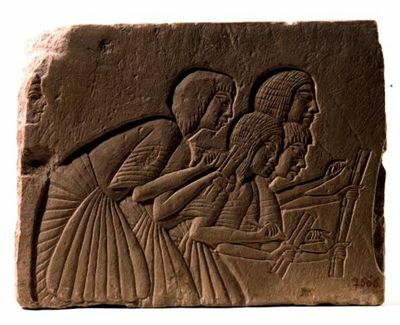 A fragment of a wall relief showing scribes intent on writing, probably under dictation, holding their tablets in their left hand and their pens in their right. The relief was part of a more elaborate composition from the tomb of Horemheb. AA.VV., Nefertari. Luce d'Egitto, Roma, 1995, pg. 173, n. 40. E. Schiaparelli, Museo Archeologico di Firenze-Antichità Egizie, Roma, 1887, pg. 313, n. 1587..